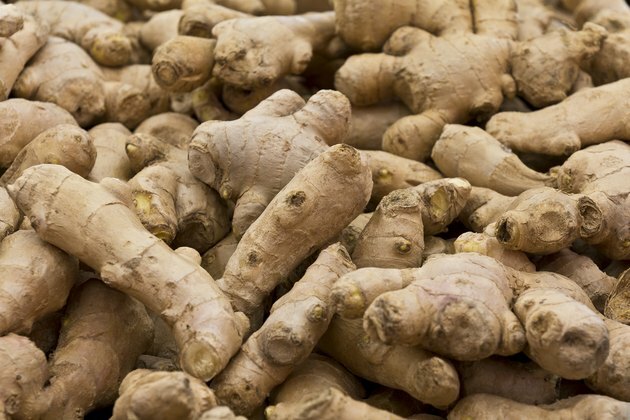 A fibrous root with a light brown outer skin, ginger root helps relieve a variety of ailments. According to California State University, ginger root soothes headaches, treats ringworm, upset stomach, sprains and bruises, and even helps calm the pain associated with toothache. Antibacterial properties found within ginger root can heal minor infections, wounds, redness and swelling associated with a minor toothache. Fresh ginger root is available in the produce aisle of most grocery stores and stores well in the refrigerator in between uses. Hold the ginger root under a faucet of cool, running water. Scrub the ginger root using a vegetable scrub brush. Dry the ginger root using a clean paper towel. Lay the ginger root on a clean cutting board. Cut a piece of ginger from the main root using a sharp paring knife. A ½ thick piece should do the trick. Remove the outer skin of the cut piece of ginger root using the knife. Place the ginger in your mouth. Bite down on the ginger root using the tooth that hurts, extracting the juice from the ginger root. Swish the juice around the painful tooth using your tongue. Chew the ginger root once it begins to soften. Continue to chew the ginger root for five minutes, swallowing afterward or spitting the pulp into a napkin for discarding. Repeat the process several times a day. If you cannot tolerate chewing the ginger root, place the cut slice in the bottom of a mug. Pour boiling water over the ginger root in the mug, creating a tea. Allow the tea to cool and steep for at least 20 minutes. Drink the tea, swishing it around the site of the sore tooth before swallowing. Wrap the unused portion of the ginger root in a piece of plastic wrap and store it in the refrigerator when not in use. Continue with the ginger root remedy for several days. If the toothache does not improve, see your dentist.